When humans sincerely aspire for happiness, harmony, peace and light, then it is the Divine Mother who helps. “The Divine Mother has always been worshipped as the sustaining soul and force of the universe. Although some of the faces that she wears are well known – Kali, the Virgin Mary, Isis, for example – many of her embodied forms have chosen to work quietly in the world. In turbulent times such as these, several incarnations of the Divine Mother move among us, each with her particular task of healing, or protection, or transformation. One of the most widely revered and loved of these Avatars of the Divine Mother is Mother Meera, a young Indian woman who was born on December 26, 1960, in the village of Chandepalle in southern India. Although she has not sought publicity, thousands of people from all over the world come to receive her darshan, her silent bestowal of grace and light through her gaze and touch. 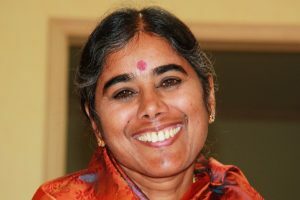 – Answers Part 1, a book of interviews with Mother Meera and an account of the Divine Mother working in the world.